by Jesseca Ormond – The annual Omicron Delta Kappa (ODK) Honors Convocation was held in the Eppley Auditorium on Wednesday, 18th April. The convocation recognizes and presents awards to students, staff and faculty who portrayed dedication in their respective fileds. Associate professor of Writng and Rhetoric Leslie Werden began the proceedings by stating that excellence should be rewarded. Co-President of ODK, Nic Madsen, believes that it is important to recognize students, faculty, and staff because it shows all the hard work and dedication that they put into their classes, events and other ventures. 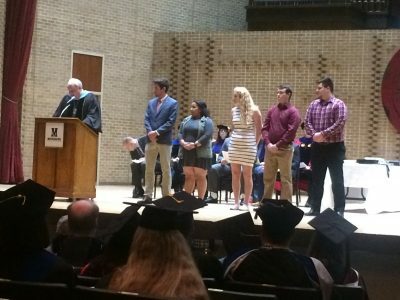 This year’s honors convocation honored retiring professor, Dr Bruce Forbes, Head of the Religious Studes Department by naming the faculty award of the year the Dr. Bruce Forbes Faculty of the Year Award. The reciepienetof this years award was Dr. Valerie Hennings, assistant professor of political science. The Student Government installation was carried out by president of the collge John Reynders. President: Antony”Tony” Patton, Vice President, Victoria “Tori” Anderson, Student Advocate:Maddie Reed, Director of Communications: Ons Souissi, Tresurer: Michael Sjuts, Secretary: Hunter Davis. Departmental Awards were presented by department heads. Marion Shapiro Art Award: Shaina Le. Outstanding Art Awards by class: junior Jesseca Ormond; sophomore Rae Clinkenbeard and freshman Ben Hieb. Outstanding Arts Administration Seniors: Alyssa Nehring and Anna Zetterlund. Faculty Award in Biology: Matthew Nieland and Austin Schmidt. Faculty Award in Chemistry: Jacob Green and Nicci McGuire. Stephen Jay Gould Award: Ashton Schweers. Biology and Chemistry Department Service Awards: Brook Boyd, Matthew Nieland and Ashton Schweers. Outstanding Accounting Senior: Nate Glisar. Institute of Management Accountants Student of the Year: Allie Gillette. Outstanding Business Senior: Jadyn Mohr. Outstanding Advertising Senior: Emma Miller. Maxine Nelson Award: Audra Corbit, Dakota Drenth, Kendy Kube, Paige Lansink, Megan Maaske and Haylee Twillman. Marcia McNee Elementary Education Award: Jessica Paxton. Dr. Sharon Ocker Endowed Scholarship for Secondary Education: Garrit Shanle. Margaret Coleman Crary Scholarship in Literary Arts: Elizabeth Roop. Bill and Lorraine Knepper Outstanding Junior English Student Award: Lindsey Smith. Elsie C. Muller Math Scholarship: Usame Suud. The Terra Industries Scholarship for Computer Science: Alex Boettger. Robert Wood Green Pre-Engineering Scholarship: Reid Jurgensmeier. Dr. John Doohen Award for Excellence in Modern Languages: Evelyn Hernandez, Sheila Ruiz and Elba Mendoza. Gahlon Family Study Abroad Scholarship: Tyler Haberman, Sarah Sadler and Devin Phaly. Professional Development and Academic Achievement in Nursing Award: Alex Allen, Kianna Kramper and Samantha Umberger. Michelle Madsen Scholarship: Maurice Blackbird. Marvin and Merry Klass Endowed Scholarship: Tyler Nordstrom. Dorothy Paulson McLarnon Music Scholarship: Katelyn Stewart. Mildred Harrington Scholarship: Emily Widman. Berdina Hospers Woodwind Award: Dylan Root. James Miller Award in Political Science: Joschua Schanda. Extraordinary Achievement in Political Science Award: Daphney Miller. Lilian Lopez presented the Volunter Awards. Volunteer awards for participation in AmeriCorps were presented to Karissa Heckens, Torie Sykes, Allyssa Stevens, Sabrina Guerra and Kelsey Brenner. Each of these stdents loged a minimum of three hundred (300) volunteer hours. David Elder presented the Phi Eta Sigma Awards to a graduating member of the national freshman honor society with the highest grade point average. This year there was a three-way tie. Matthew Nielandm, Austin Schmidt and Jason Kenny of Schaller are all graduating with 4.0 GPAs. Annie More presented the Alpha Lambda Delta awards. The freshman women’s honor society Maria Leonard Senior Book Award, for the graduating member with the highest grade point average, went to Ashton Schweers and Karissa Heckens. Nomine for the honor society’s Jo Anne J. Trow National Scholarship was Karissa Heckens. Pennington Graduate Fellowship Award went to Allyssa Stevens. Dr. Mike Nichols Graduate Fellowship to 2017 graduate Natasha Hongsermeier-Graves. Antony Patton presented the Student Government Event of the Year to the Alpha Psi Omega theatre honor society for the 24-hour movie marathon. Alethic awards were presented by Tim Jagger to Jason Kenny and Jenna Bork. The ODK Freshman of the Year was Sterling Stecker and the ODK Sophomore Cup was awarded to Kevin Hancock. The Tommeraasen Award of Excellence for the outstanding campus organization was awarded to the Morningside Civic Union. Andy Nelson, campus chaplain, was awarded the Staff Memberof the Year.